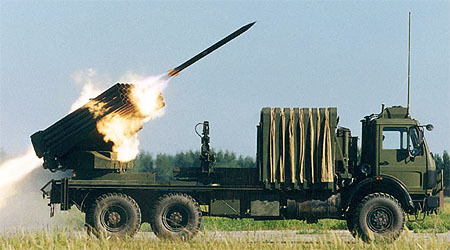 The Chinese Type 90 122mm MLRS system utilizing/based on the Russian BM-21 Grad’s launcher. The vehicle was developed as the replacement for the older Type 81, which it too had the same BM-21 Grad’s launcher and entered PLA service around the early 1990’s. The vehicle is based on the 2629 6X6 military truck, which is longer than the Type 81’s. The increased length means that the vehicle can mount a reloading mechanism which contains a rack of 40 spare rockets. This is able to reload the launcher in a reported time of 3 minutes and allows the vehicle to remain in the fight for longer before having to withdraw to reload. The Type 90 fires 122mm fin-stabilised free rockets to a minimum range of 10~12km and a maximum range of 20~40km depending on the rocket type. The rocket can be fitted with various types of warheads including anti-armour/personnel sub-munitions, blasting, fuel air explosive (FAE), and high-explosive (HE).